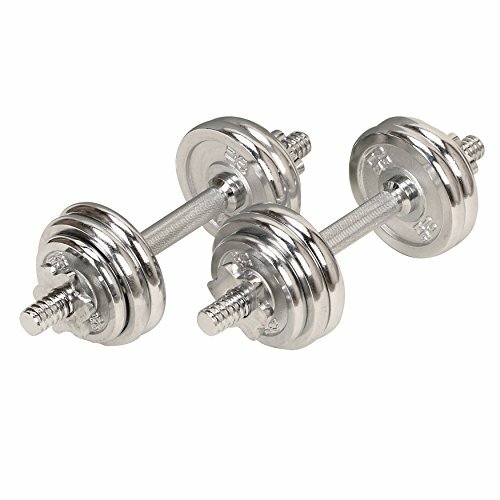 Develop strong chest and arm muscles Durable steel construction with chrome finish Threaded bars weigh 4 lbs. each Eight 2.5 lb. weights + (4) 1.25 lb. weights + (2) 4 lb. bars = 33 lbs. Comes with case for convenient carrying and storage Manufacturer's warranty included - see Product Guarantee area for complete details About Sunny Health & Fitness Sunny Health & Fitness has been importing and distributing high-quality health and fitness products for over ten years. From their headquarters in Los Angeles, California, they import equipment from direct sources in Taiwan and China to provide more competitive pricing than the average health and fitness equipment distributor. Because they are committed to excellence and stand behind the quality of every one of their products, Sunny Health & Fitness has become one of the fastest-growing companies in the market. Steel construction, chrome finish. Eight 2.5 lb. weights, (4) 1.25 lb. weights. Each threaded bar weighs 4 lbs.. Carrying case for convenience. 90 day manufacturer's warranty included.